Do you ever have deja vu moments at work? One of the most common is the performance review — negative performance feedback that surfaces year after year. 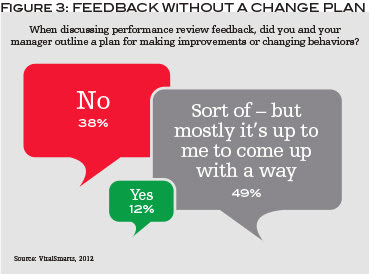 Detailed performance feedback is important, yet insufficient to change behavior. If talent managers apply the science behind behavior change to their review processes, they can help employees put their performance feedback into action and reverse this trend. The November 2012 study “Avoiding a Deja Vu Performance Review” from VitalSmarts, a training and leadership development company for which the author works, surveyed 642 individuals and found 43 percent of employees experienced a deja vu performance review last year (Figure 1). Data revealed that many leaders found themselves talking about an issue in much the same way as was done in previous reviews. Leaders often feel stuck when they tell a direct report to improve, then the next review comes around and the person hasn’t improved. Direct reports who receive the same admonition to improve their performance year in and year out may feel embarrassed and annoyed because they haven’t changed and their boss keeps pointing out their long-lived foibles. One reason performance reviews are largely ineffective is employees lack the ability to put performance feedback in action. Eighty-seven percent of respondents said they left their review without a plan for how to better meet their managers’ expectations, and half said it’s up to them to find a way to change. 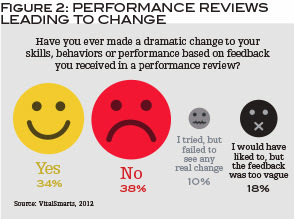 Detailed performance feedback is important, yet it’s insufficient to change behavior. Without a performance improvement plan targeting the sources of influence that determine why people make the choices they do, employees will continue to receive the same negative feedback, and both employee and company growth will be stunted (Figure 3). However, talent managers can increase the effectiveness of performance reviews by providing employees with the skills to put their performance feedback into action. When employees harness personal, social and structural influences to support desirable behaviors, persistent and resistant problems can be changed. According to research published in the Fall 2008 issue of MIT Sloan Management Review, those who use the following sources of influence in combination are 10 times more successful in changing behavior than those who rely on a single source of influence, and VitalSmarts’ research reiterates this. Personal motivation: When individuals remain stuck at an old performance level, it’s often because any improvement calls for actions that aren’t inherently satisfying. Doing the right thing can be repetitive, nerve-racking, fatiguing or otherwise undesirable — at least to the person in question. Doing the wrong thing, however, is a breeze. So it comes as no surprise that if undesirable tasks are required, failure to do them ends up being discussed during a performance review. The boss then highlights the importance of the task and the direct report resolves to do better, but doesn’t. With time, the boss gets increasingly nervous as the problem escalates. The second time a person fails to do what is required, not only is he or she coming up short in performing a task, he or she is now failing to live up to the promise made during the last review. For years leaders have been encouraged to nip this sort of corporate recidivism in the bud. According to VitalSmarts’ April 2013 study “Leaders Lack Influence,” undesirable behaviors have become so tolerated 94 percent of them persist for a year or longer, and a third report the problems persisted for more than 10 years (Figure 4). If the task employees fail at is required, and the person in question repeatedly vows to improve, action must be taken. Otherwise the review process is nothing but a hollow threat. Personal ability: The majority of employees who haven’t resolved a performance problem since their last review are aware that their boss isn’t satisfied with a certain aspect of their performance, but they may not know what to change. Some 40 percent of respondents in the “Avoiding a Deja Vu Performance Review” study said they weren’t surprised to receive negative feedback, though 37 percent said the feedback was too vague to take action on. This gap in understanding typically stems from the fact that the boss describes a broad band of personality characteristics using inherently vague terms such as “unreliable,” “inconsistent” or “lacking initiative.” These terms may hold deep meaning for the boss, but the direct report is often left guessing what he or she did that led to such a conclusion. Ability also comes into play when bosses refer solely to results when discussing performance. Individuals are held to a standard such as “keep errors to less than one-tenth of 1 percent” or “produce 10,000 units a month,” and then they’re left alone to figure out how to achieve the objective. Their bosses figure they hired the person to hit the numbers by whatever means possible. It’s the employee’s job to figure out how. If this is the case, then all that can take place during a review is another failure discussion. People know they aren’t on target, know they need to improve, but don’t know what to do. To coach people to the next performance level, talent managers must help leaders learn how to identify specific actions or tactics employees can follow, and then hold them accountable to these tactics. If not, they’ll join the ranks of those who routinely recite the obvious. Social motivation and social ability: Sometimes individuals repeatedly come up short in one area of their job because they’re doing their best to please everybody. Colleagues stop by and ask them to help out on a task, other bosses give them assignments, and eventually individuals find themselves with insufficient time to do their job. Therefore, certain aspects of their performance suffer. On other occasions, co-workers don’t provide employees with the information or materials they need, so the employees end up doing others’ work while allowing their own to suffer. In both cases, the social system must be considered to understand all of the factors that add up to inadequate performance. Talent managers must encourage leaders to take steps to ensure their employees are surrounded by co-workers who both motivate and enable them to do what is required rather than distract or discourage optimal performance. Structural motivation: Most people quickly learn that what they were asked to do and what they’re rewarded for doing are two different things. For instance, when it comes to hitting deadlines, individuals are praised and given promotions, bonuses or even plum job assignments. They’re chided for not hitting quality specifications, but it doesn’t hurt their rewards in any way. So they let quality slip. To avoid mixed messages, examine performance problems in light of formal rewards. Does the system measure and fail to reward certain requisite actions? If so, bring the formal system in alignment with the behavior desired. Then help employees see how continuing to receive the same negative feedback may cause them to miss out on raises and promotions. According to the study, 15 percent of employees who continue to receive negative feedback report receiving less of a raise than they expected, and 7 percent are passed up for a job assignment or promotion. Structural ability: Finally, do systems, policies, equipment, software and other things make it difficult for a person to do required tasks? The easiest place to turn for a solution when others fail to routinely complete a task is the physical environment. Once changes are made to the environment, employees can last for years. For instance, provide people with better software to keep track of their tasks, and those tasks are more likely to be completed. Remove seven levels of signatures, and the approval process, always late before, will be done on time. If an individual isn’t collaborating with a key colleague, move their desks next to each other. Where possible, change the environment and watch behavior change as well. So, the next time an individual isn’t making performance improvements despite several performance discussions, look to the sources of influence that may be contributing to the failure. The more sources employees have working in their favor, the more likely they are to change. Kerry Patterson is co-founder of VitalSmarts, a corporate training and leadership development company. He can be reached at editor@talentmgt.com.